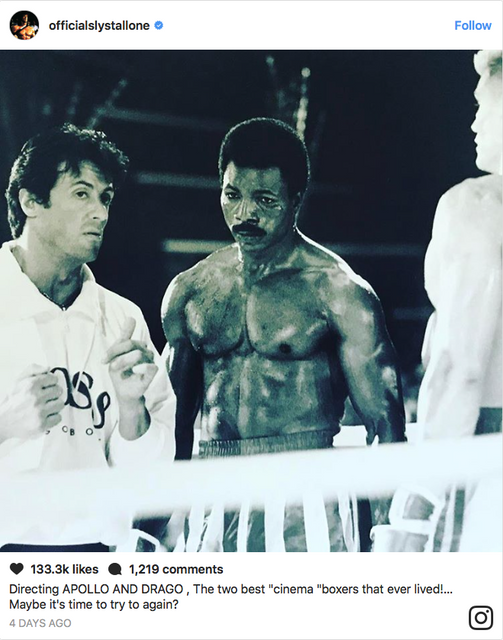 This is just Sylvester Stallone teasing his ideas for a possible Creed 2 on his Instagram, so take that for however much it's worth. Well, Dolph seems to imply it as well. I really would like this to happen. First Aquaman for Dolph and then Creed 2. Great for his career! Representatives for Stallone had “nothing to add” when reached by EW. New Line Cinema and reps for Creed director Ryan Coogler did not immediately respond to EW’s request for comment. I would love nothing more than a steady working relationship between Dolph and Warner Bros. 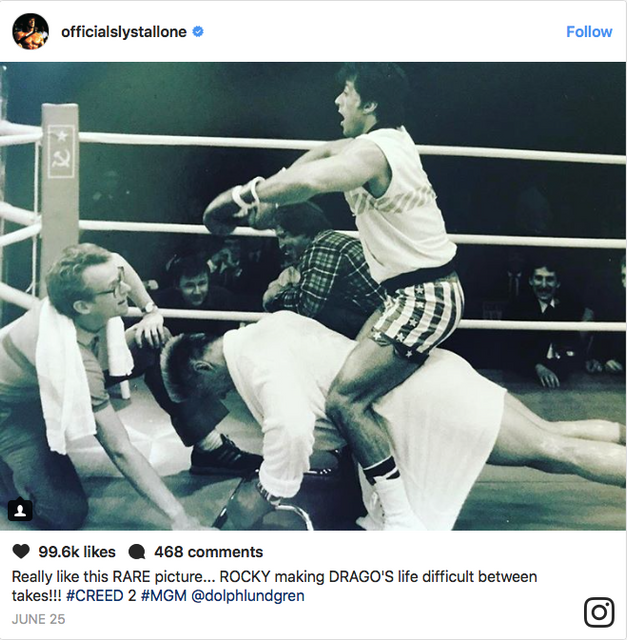 In a new Instagram post, Rocky creator Sylvester Stallone confirmed several things about MGM‘s in-development Creed II. For one, that he himself has written the full script, or at least what will serve as the basis for the script, after Ryan Coogler and Aaron Covington wrote the last one by themselves. 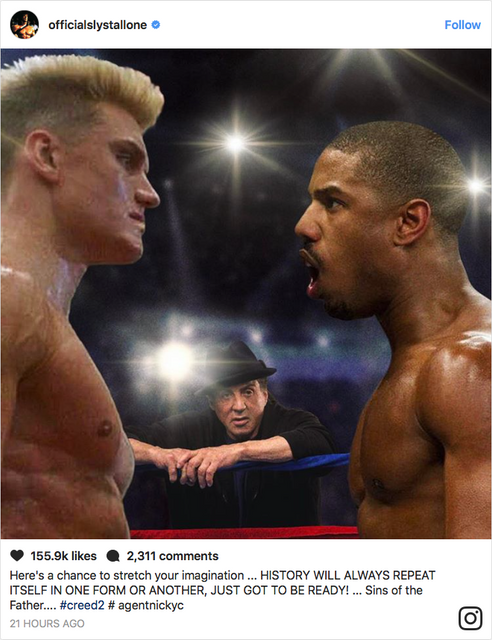 Second, he has solidified what many had assumed for a while, which is that Dolph Lundgren’s Ivan Drago, and probably his offspring, will be involved in a big bloody battle with Adonis Creed in the ring. That still seems very ambiguous to me (otherwise he also "announced" COBRA 2 and other stuff) but whatever. with Drago the fourth Rocky was the highest grossed film of the series, so Sly with producers don't care about what you have said. i'm personally excited about this project. True, producers don't care about my opinions. Thanks for pointing out the obvious. I'm still entitled to express them. And ROCKY IV was 1985 -- well over 30 years ago. Movies have changed. Audiences have changed. Coogler pumped new blood into the franchise, which is hard to deny. Regardless, it's all in the rumor stages, so there's no need to get our hopes up (or down). Exactly, I mean it has to follow the serious and gritty tone of the original CREED all while building up the plot and characters in a sensible and realistic way. So I really hope Coogler is deeply involved in the process otherwise Sly will likely take the easy route and surf on the unpredicted success of the first one with predictable stuff (and his career not in a desperate situation enough -which is always when he puts his best- to go deep in his guts like with ROCKY I or ROCKY BALBOA). sorry, mate, if my post was rude. i'm not a native english speaker and sometimes i can't express my mind nice. i think the director of the original movie is not involved. he has bigger things to do already. my guess. "You know I gotta hit Drago once." if dolph will be busy in oct/nov/dec/jan, then what about his role in Aquaman?